Till now we were discussing the various concepts and equations such as continuity equation, Euler equation, Bernoulli’s equation and momentum equation for incompressible fluid flow. In same way we have also discussed above equations for compressible fluid flow. We have already seen the derivation of continuity equation, Bernoulli’s equation, momentum equation, velocity of sound in an isothermal process, expression for velocity of sound in an adiabatic process and also the basic fundamentals of stagnation properties i.e. stagnation pressure,stagnation temperature and stagnation density for compressible fluid flow in our previous posts. Now we will discuss the area velocity relationship for compressible flow with the help of this post. As we know that for incompressible fluid, continuity equation provides the relationship between area and velocity and it is as mentioned here. 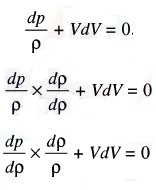 We can conclude from above equation that velocity will be decreased with increase in area. If we consider for compressible fluid flow, above equation will not be valid. Continuity equation for compressible fluid will be given by following equation as mentioned here. We can conclude from above equation that velocity and density both parameters will be affected with variation in the value of area. Let us differentiate the continuity equation of compressible fluid and we will have following equation as mentioned here. Let us recall the Euler’s equation as mentioned here. Now we will recall the expression for the velocity of sound wave in a fluid as mentioned here. Considering the above equation of velocity of sound wave in a fluid, we will have following equation as mentioned here. Above equation shows the variation of area with variation of velocity for different mach numbers. We will discuss now force exerted by jet on stationary vertical plate in our next post.